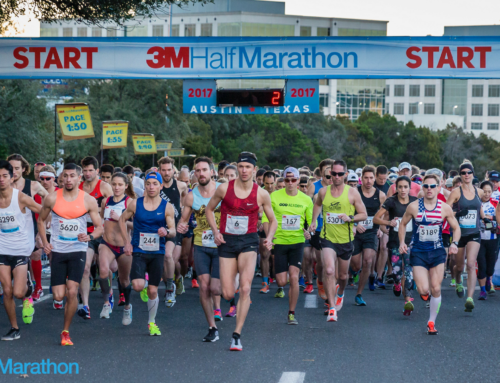 There is absolutely no question that the key to having a good race during next Sunday’s Austin Marathon or Half Marathon (February 14th) is having a familiarity with the numerous hills that punctuate both courses. These hills must be run smoothly and well-paced. Push too hard on the uphills and you’ll run out of gas. Fly down some of the steep downhills and you’ll pound your quads and have nothing left for the tougher uphill portions. Both courses are identical to the ones that were used last year with the same start and finish for both races. The starting point is Cesar Chavez and the Ann Richards Congress Avenue Bridge with the finish on Congress at 10th Street in the shadow of the Texas State Capitol. The Austin course is not an easy one, but you still have time to acquaint yourself with all the hills on the course. If you haven’t run them before (hard to believe), divide the course into sections this week and either run or drive the most critical ones. S. Congress Avenue (miles 1-3). Heading south on Congress from Cesar Chavez to Ben White is the longest uphill on the course and the one with the greatest climb. Fortunately, the stretch along Congress comes so early in the race that all the marathoners and half marathoners have fresh legs at this point. The steepest part of the Congress hills comes right at the beginning as soon as the field crosses the Ann Richards Congress Avenue Bridge and crosses Riverside all the way up to St. Edward’s University (just past the 2-mile mark). There, Congress plateaus out before a short, final climb to the Ben White access road (three miles) and then there’s another gradual uphill to South 1st Street. 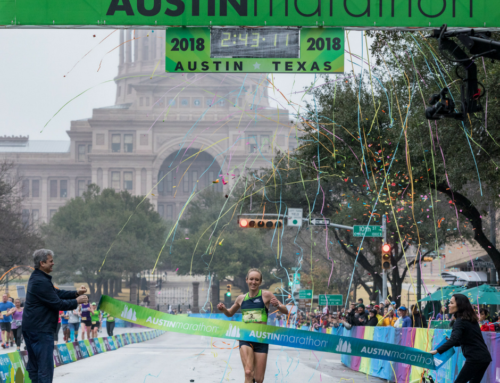 The tendency along Congress is to push too hard and get away from your marathon goal pace, but veteran Austin marathoners know to relax and settle in on this stretch. Enfield (mile 10). After a flat, 2-mile long stretch on Lake Austin Boulevard (miles 8-10), the course takes a hard right (just past Hula Hut) onto Enfield. There’s a very short, but steep ascent to Enfield where you can lose your momentum. After that, there are three rolling hills on Enfield that aren’t especially difficult. Exposition hills (miles 10 ½ -12). The half marathoners leave the marathoners who make the climb up the long series of Expo hills that are the most difficult on the course. Training on Expo is one thing; racing it is altogether different. Although it’s a long climb up Expo to 35th Street at Camp Mabry (mile 12), there are also three steep downhills that can not be attacked because right after each one is another uphill. The climb up Expo is one of the key sections of the marathon course as it’s important to maintain your momentum and stay on goal pace without pushing the downhills too hard. The final Expo hill comes as you approach 35th Street and it’s the steepest. Unfortunately, once you crest Expo, there are two more little stingers on the short climb to MoPac and then another short one to the MoPac overpass. Jackson/Bull Creek/Shoal Creek (miles 12 ½ -15). After the MoPac overpass, the course hooks a left on Jackson for a long, gradual grade that you might not even notice. This is a beautiful part of the course through the Allandale neighborhood on an uphill section which is not especially difficult. But, it’s still a climb. White Rock/Great Northern (miles 15-17). Following the uphill grade along Shoal Creek, there’s another short uphill on White Rock which funnels the marathon field onto Great Northern. This 1 ½ -mile stretch also isn’t particularly difficult, but it’s a gradual incline and you’ll certainly notice it as you approach the Northcross Mall. This is the most northern point of the course and almost all of the most difficult climbs are behind you—except for the final one. North Loop (miles 21-22). Another series of rolling hills that ordinarily wouldn’t be hard, but after 21 miles of running, any grade is tough. San Jacinto (25.7 miles). 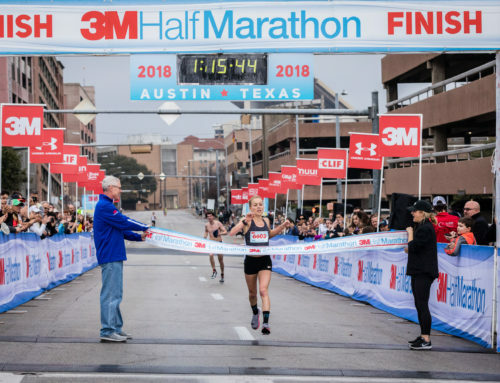 One major change is that instead of climbing the San Jac hills twice as in years past, starting with last year’s race, marathoners only have to do it once. (The half marathoners avoid it completely.) The problem is these final little hills—just east of the Capitol grounds—come at a bad spot in the race when everyone is depleted and very tired and just want to get to the finish. You can hear the finish line announcer and the crowd at the finish, but first you must get up and over the three San Jac hills before banging a right on 11th and then a left to the downhill finish on Congress. S. 1st Street (miles 3 ½-6). This is the longest continuous downhill on the course and goes from Ben White all the way back to Riverside. There are a couple of steep sections, but the steepest on the entire course is between miles five and six, opposite the Texas School for the Deaf track. A good spot for the half marathoners to gain some momentum and also a key section for the marathoners to get back on marathon goal pace. Cesar Chavez (miles 6 ½ -8). Just after passing Austin City Hall (and the huge crowds that gather there), there’s a nice downhill and flat section that carries you along Lady Bird Lake toward Austin High. But watch out for the short uphill at Veterans that brings the field up to Lake Austin Boulevard. Duval and San Jacinto (miles 23-25). One of the beauties of the course are these three downhills, through the Hyde Park neighborhood on the run back through the fringes of the UT campus, that come in the closing stages of the race. Unlike some of the downhills in the early part of the race, these three are very gradual (with one steep pitch on Duval) on which you can open up your stride and if you have anything left, pick up the pace. At mile 24 ½, the course crosses Dean Keaton and picks up San Jacinto. At this point around mile 25, San Jac has one especially nice downhill section alongside DKR Stadium. 11th Street and Congress. Once up and over the San Jac hills, you bang a right on 11th Street for the short downhill to Congress. Yippee.